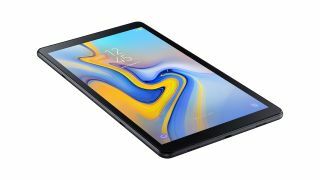 Samsung's just-announced Galaxy Tab S4 is the company's flagship tablet for 2018, and while that might be exciting news for some, the not-exactly-cheap price tag of $649 (£599, around AU$880) will likely put just as many potential buyers off. Android tablet fans on a tighter budget need not fret, however, as Samsung still has you covered: it's also announced a new 2018 version of its larger Galaxy Tab A tablet. It even includes a lot of the same design notes as the Tab S4, although it has been somewhat scaled back when it comes to its range of features and overall horsepower. Like the Tab S4, this cheaper option sports a 10.5-inch display, shares the same 7,300mAh battery and four-speaker Dolby Atmos sound system, but from there the two units do diverge somewhat. For starters, the Tab A's 10.5-inch display is only a 1080p LCD panel, not the brilliant 2,560 x 1,600 pixel AMOLED screen you'll find on the Tab S4. There’s also just 3GB of RAM as opposed to 4GB, and 32GB of onboard storage instead of the options of 64GB or 256GB of the more expensive Tab S4s. Also, under the Tab A's hood is a mid-tier Snapdragon 450 processor, as opposed to the S4's more powerful octa-core Snapdragon 835. And horsepower isn’t the only thing that’s scaled back. Where the Tab S4 arrives with the S Pen and DeX support, the cheaper Tab A offers neither of those expansion options. Also missing on the Tab A is support for fast charging. While the Tab S4 sports a 13MP rear camera and a front-facing 8MP snapper, the Tab A gets by with a 8MP (rear) and 5MP (front) camera system. Although the Tab A lacks all the bells and whistles of its more premium counterpart, Samsung is marketing it to a much broader audience – one that theoretically doesn't need peak performance and top-of-the-line features. Samsung says it considers the Tab A 10.5 to be “fit for the whole family” – it's a passable workhorse for adults and a good entertainment device for the kids. And with the latter in mind, the Tab A comes with a Kids Mode that gives parents control over what the kids watch and for how long. Pricing information and an actual release date for the Tab A 10.5 hasn’t been announced yet, but it’s definitely not going to set you back a whopping $649 / £599. We’ll likely know more when the Tab S4 pre-orders go live on August 9, which is incidentally the same day that the highly-anticipated Samsung Galaxy Note 9 launches.